Jeffrey Fox consults with top-notch organizations around the world. He is consigliore to CEOs and senior executives. Fox & Company is in the business of helping clients grow revenues and increase gross margins. 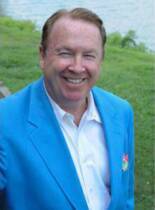 He has written twelve international best-selling books, and regularly speaks to organizations and company sales forces. Prior to starting Fox & Company, Jeffrey worked in senior positions for three high powered consumer and industrial marketing companies. He was Vice President, Marketing and a Corporate Vice President of Loctite Corp., now Henkel/Loctite. He was Director of Marketing for the wine divisions of The Pillsbury Company. He was the Director of New Products for Heublein, Inc., now Diageo. All three companies became clients of Fox & Company. Jeffrey is the winner of Sales & Marketing Management magazine's "Oustanding Marketer Award", winner of the American Marketing Association's "Outstanding Marketer in Connecticut", and the National Distributors Association award as the nation's "Best Industrial Marketer". He is the subject of a Harvard Business School case study that is rated one of the top 100 case studies and which is thought to be the most widely taught marketing case in the world. Jeffrey graduated from Trinity College in Hartford, CT, where he was a Capitol Area Scholar. He earned his MBA from Harvard Business School. He has served as an elected Trustee of Trinity College, where he has won several alumni awards, including Person of the Year. He served on the Board of Directors of Saint Francis Hospital, one of the top 100 hospitals in the United States. How to Become a Fierce Competitor is timely and timeless. It is a quick read of lessons and rules on what managers must do in tough economic times. Short, snappy chapters. Great stories from some of the world's fierce competitor companies. How to Become CEO As with all of the books in the Fox series, it is for ambitious people of any age. It was a NY Times, Wall Street Journal, Business Week, and Amazon.com best-seller. It was one of four of Jeff's books to be #1 best-sellers in France. It was #1 in Turkey, Singapore, Russia, and Hong Kong. It is published in over thirty languages. How to Become a Rainmaker was selected as one of the "100 Best Business Books Of All Time". The Secrets of Great Rainmakers is a partner book to Rainmaker. Both are essential to salespeople. Rain: What a Paperboy Learned About Business is a cool little book. Rain is a thirteen year old who delivers the morning paper in New England. Rain faces challenges in each chapter, which he solves in surprising ways. He faces a bully, customers who won't pay, mean dogs, and sales contests he must win. The second half of the book is called The Rain Reader. Readers are able to link the metaphors in Rain to their personal and business lives. Rainwon an "Audie" as the Best Business Audio Book of the Year in 2010. 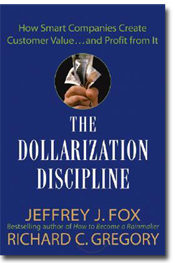 The Dollarization Discipline shows manager how to calculate the quantified value proposition of their products, and to express that value in dollars and cents, pounds and euros, or any currency. 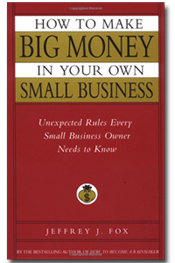 Dollarization was selected as one of the "Top Thirty Business Books of the Year" in 2005. How to Become a Great Boss is required or recommended reading in many of the great corporations of the world. How To Become A Marketing Superstar, as with all of Jeff's books, is filled with contrarian rules on how to build brands, price to value, write headlines, and get market share. The book includes five "Instant Marketing Challenges" that test the acumen of people in the marketing game. How To Land Your Dream Job was originally published as "Don't Send A Resume: And Other Contrarian Rules To Land A Job". This book is a cult favorite among job seekers, especially university graduates and people who have lost a job mid-career. How To Get To The Top: Business Lessons Learned At The Dinner Tablecaptures the lessons successful people learned from parents, grandparents, elders, coaches, and mentors. How To Become a Great Boss compiles what should be common-sense guidelines for effective leadership and presents them in a manner that is both educational and inspirational. Fox has the ability to get you thinking about what you are doing as a manager and about the things that you have allowed to fall by the wayside. In The Transformative CEO, Jeffrey Fox and Robert Reiss have identified the key traits and characteristics that describe this remarkable type of leader. Filled with fascinating insights from superstar CEOs, this one-of-a-kind guide puts you right on the front lines with the men and women who have transformed businesses with spectacular success. Jeffrey Fox's books have been described as contrarian, short, fast reads, to the point with no nuances.